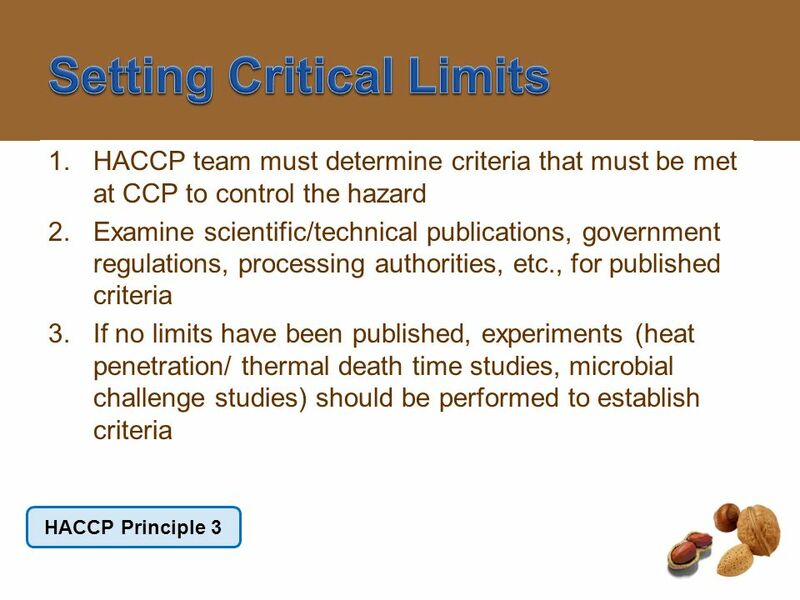 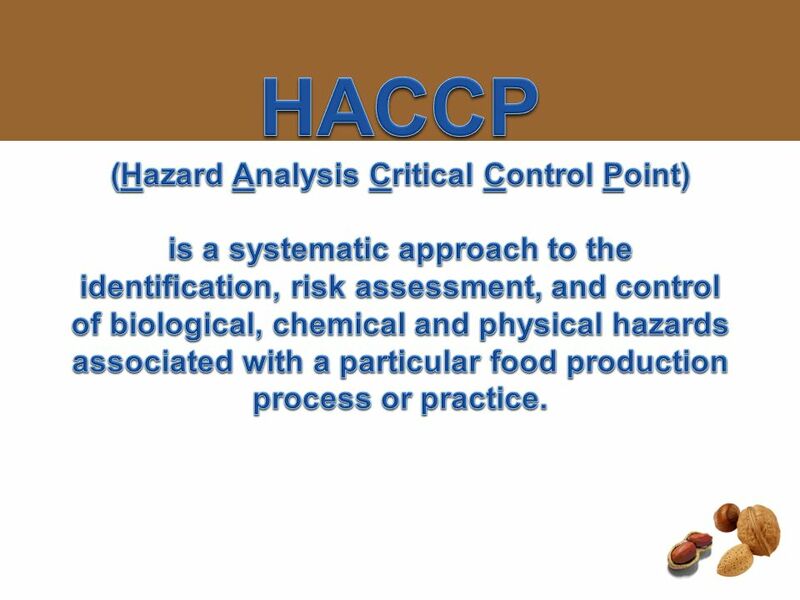 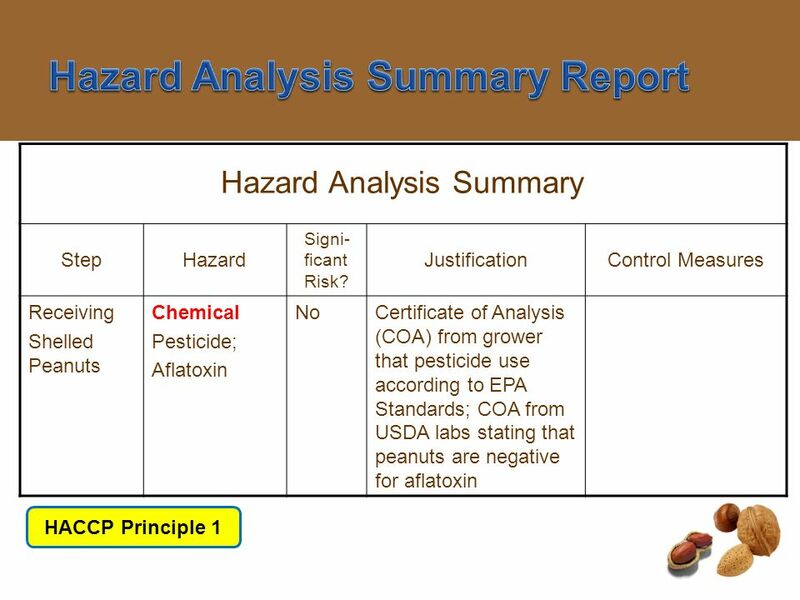 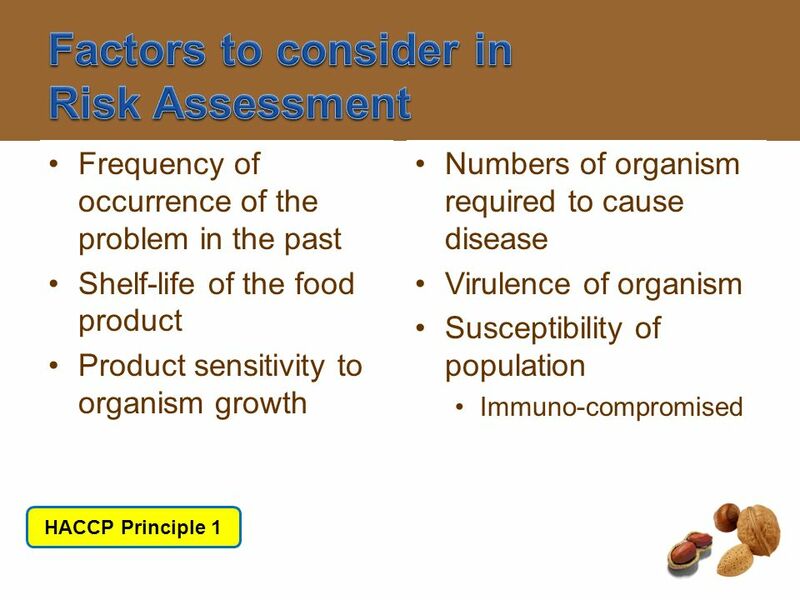 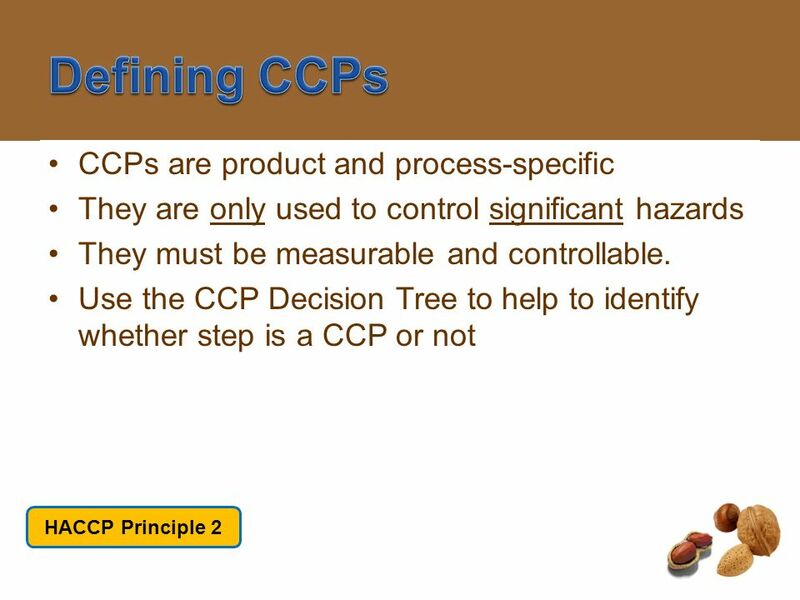 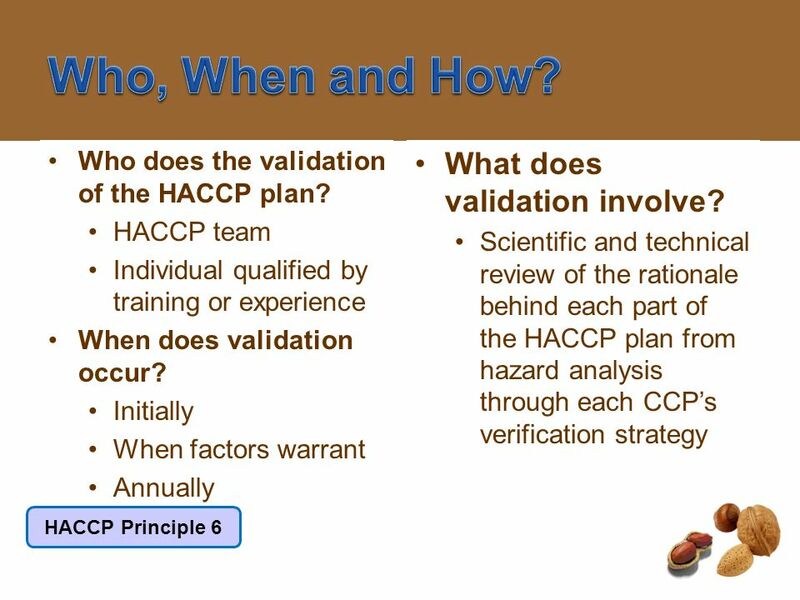 3 HACCP (Hazard Analysis Critical Control Point) is a systematic approach to the identification, risk assessment, and control of biological, chemical and physical hazards associated with a particular food production process or practice. 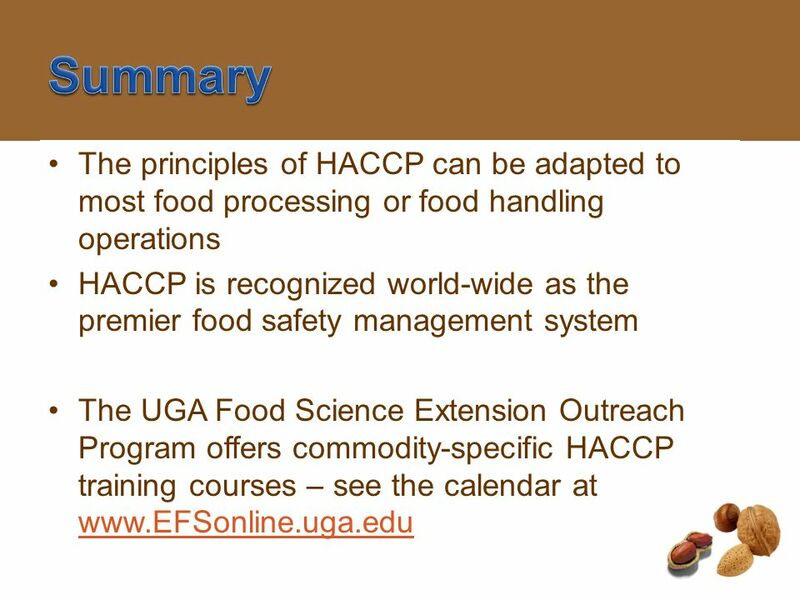 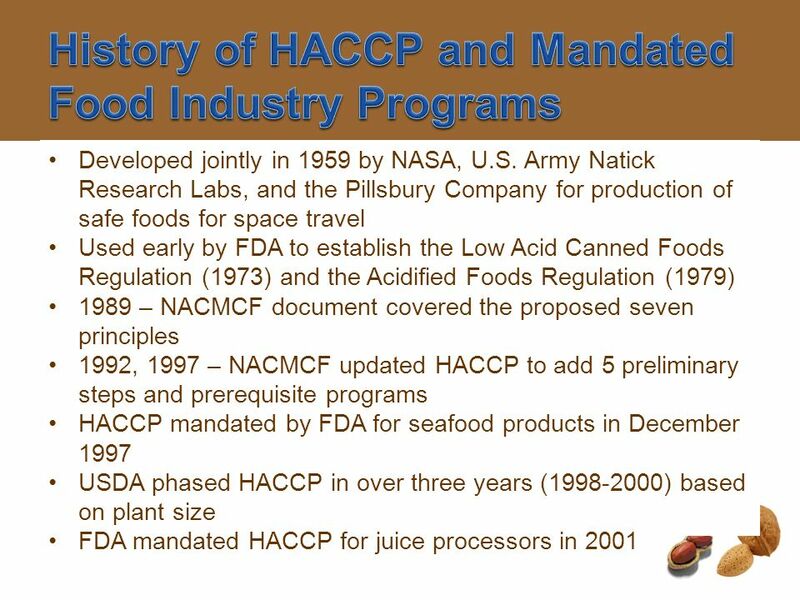 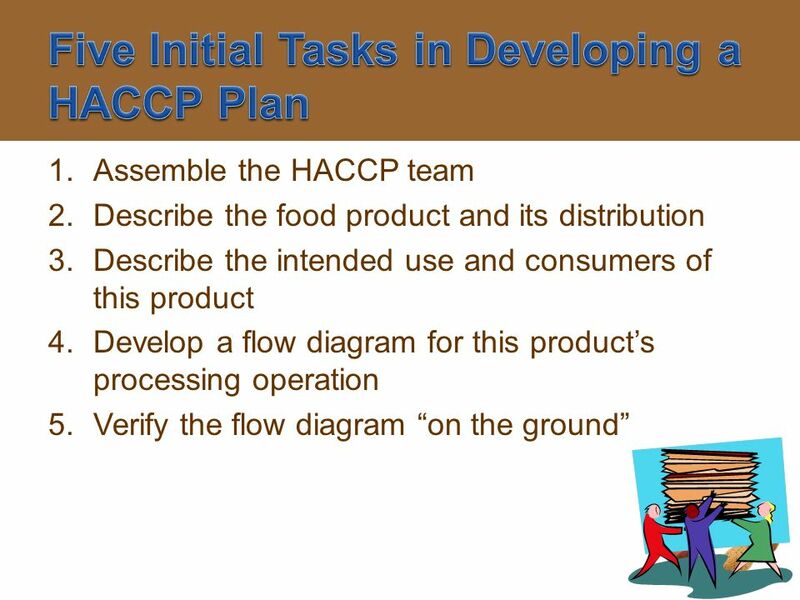 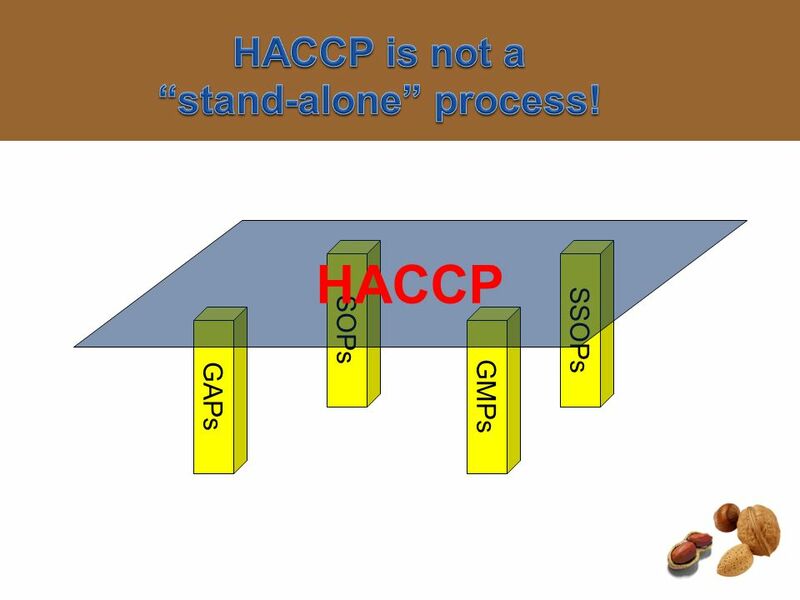 6 HACCP is not a “stand-alone” process! 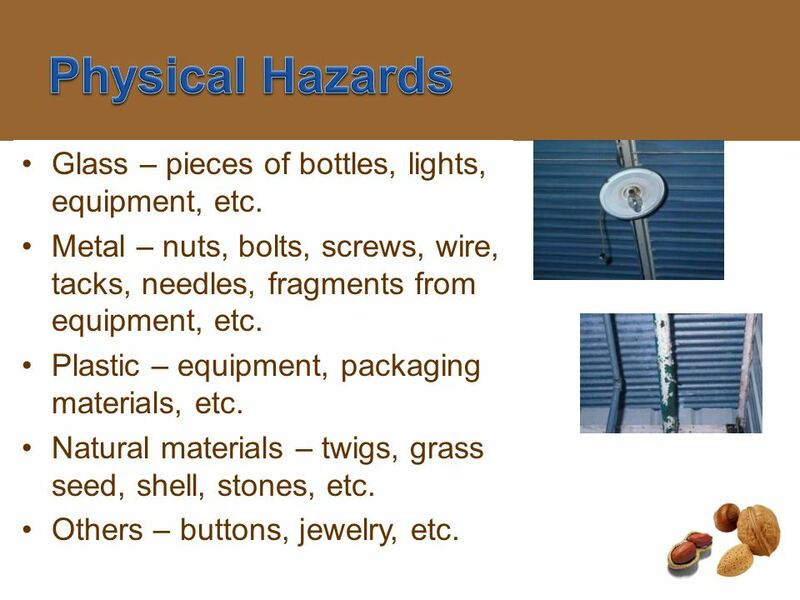 10 Physical Hazards Glass – pieces of bottles, lights, equipment, etc. 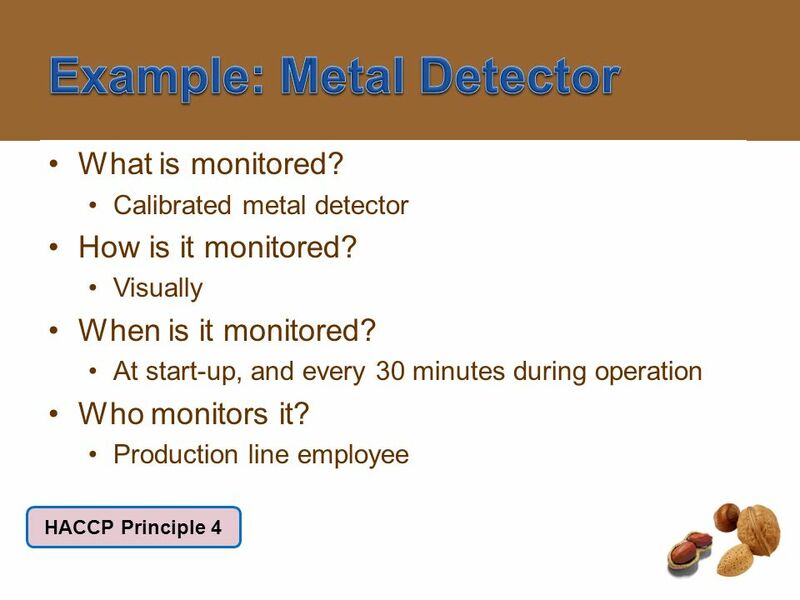 Metal – nuts, bolts, screws, wire, tacks, needles, fragments from equipment, etc. 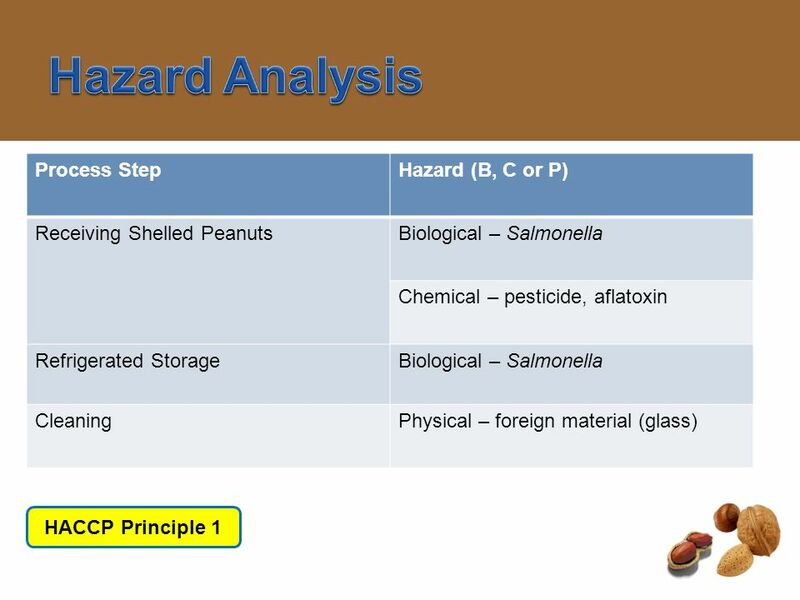 Plastic – equipment, packaging materials, etc. 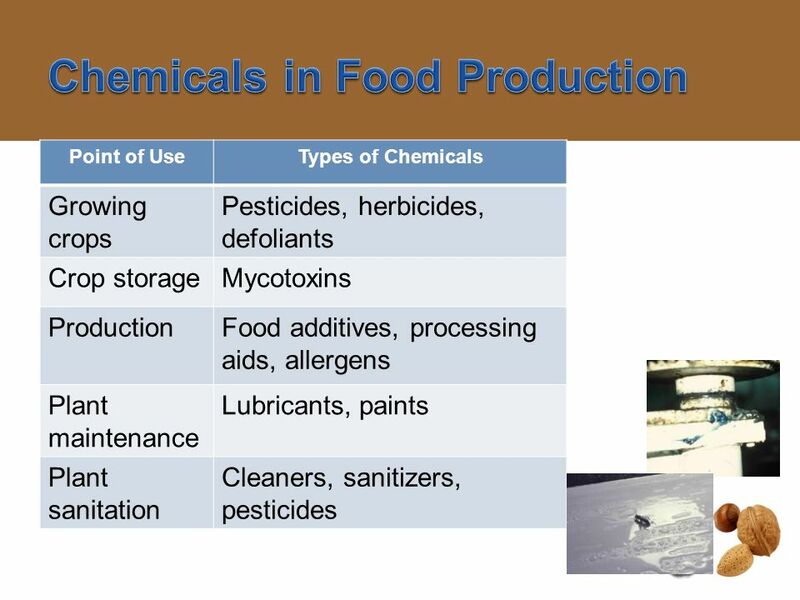 Natural materials – twigs, grass seed, shell, stones, etc. 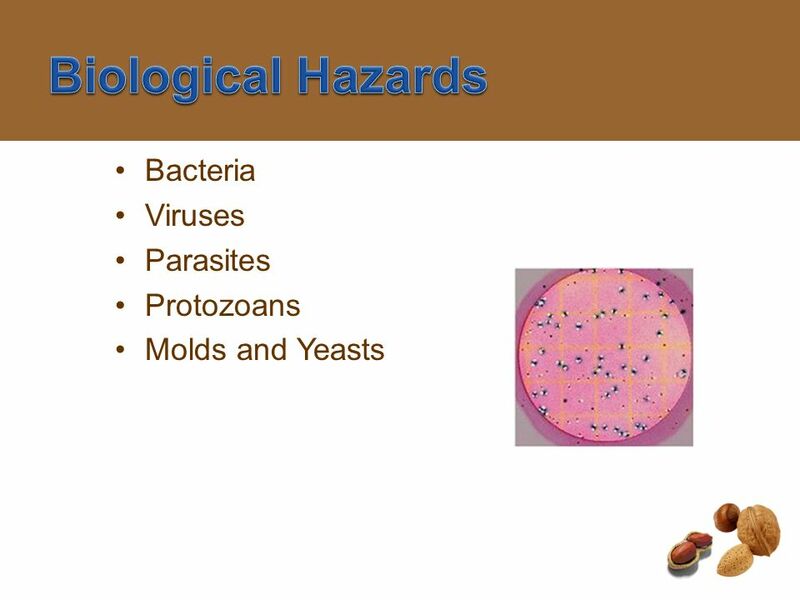 Others – buttons, jewelry, etc. 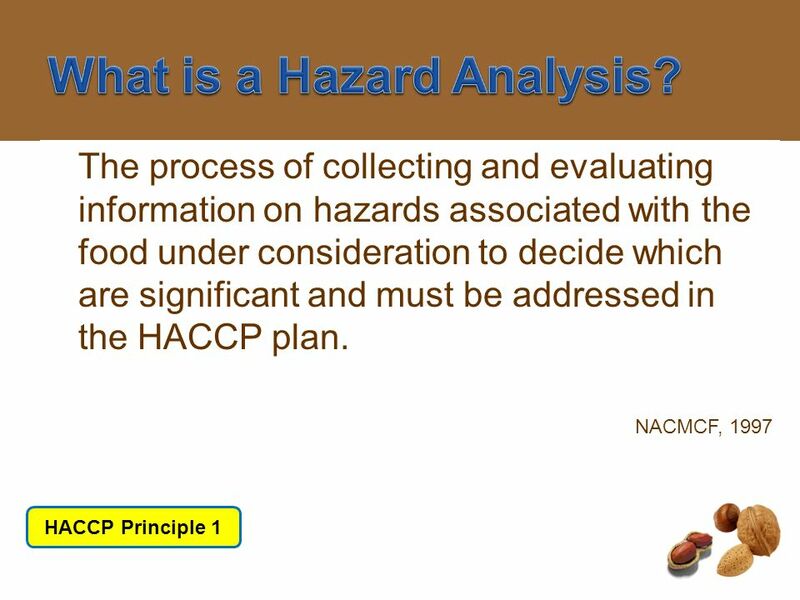 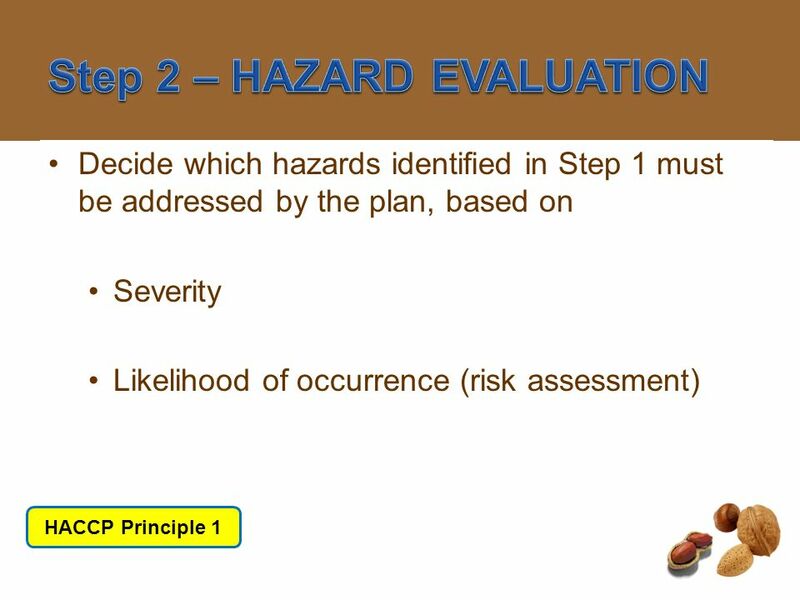 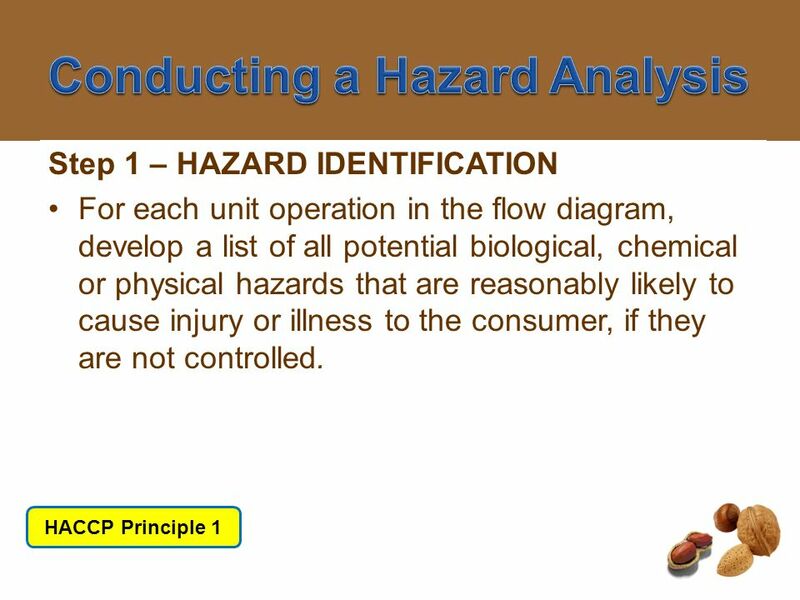 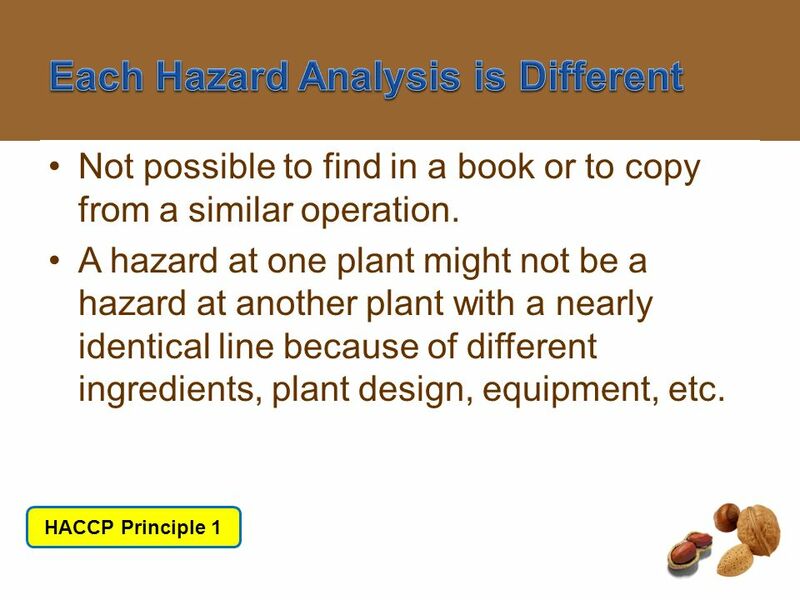 13 What is a Hazard Analysis? 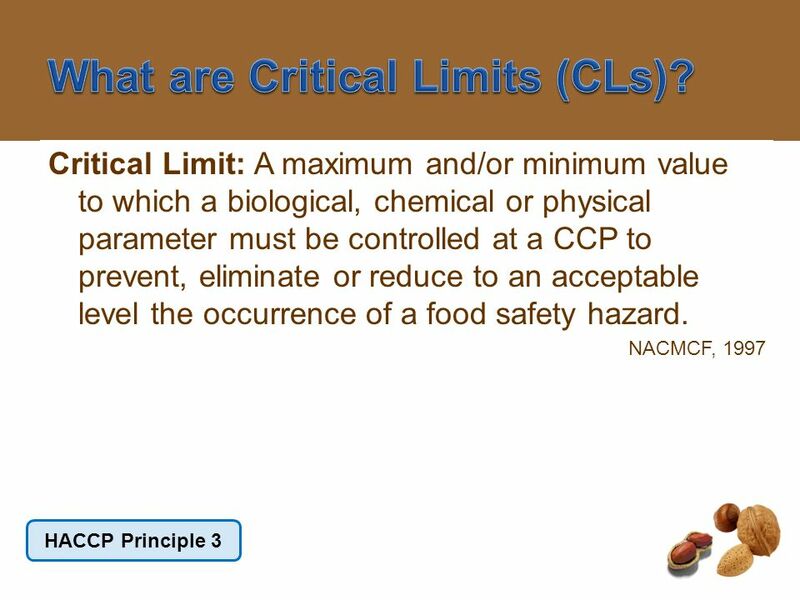 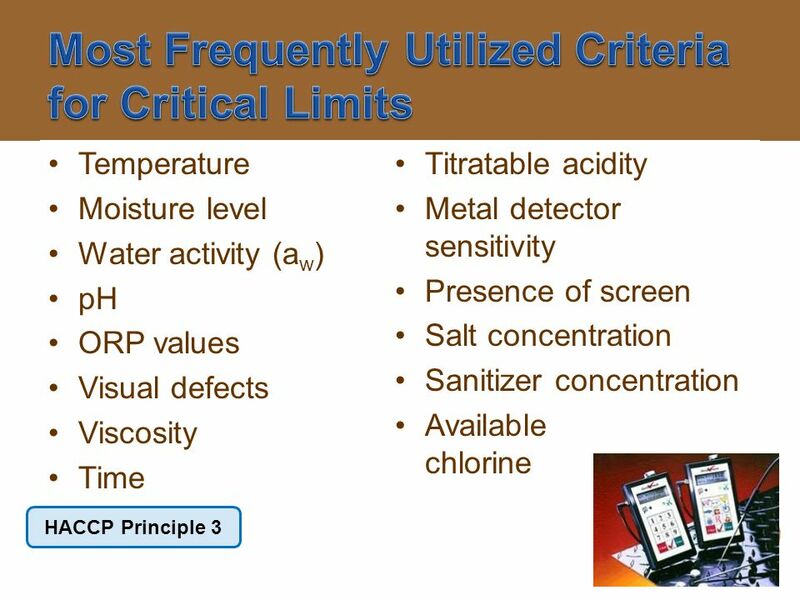 27 What are Critical Limits (CLs)? 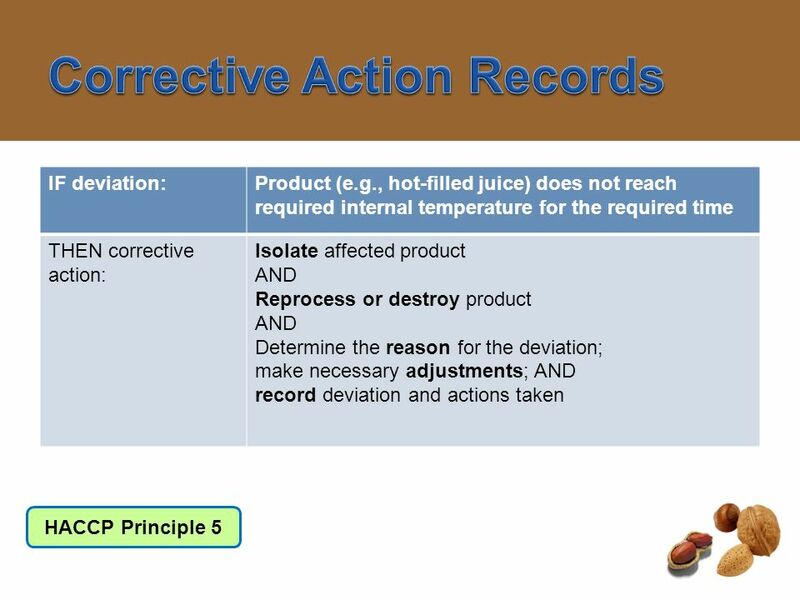 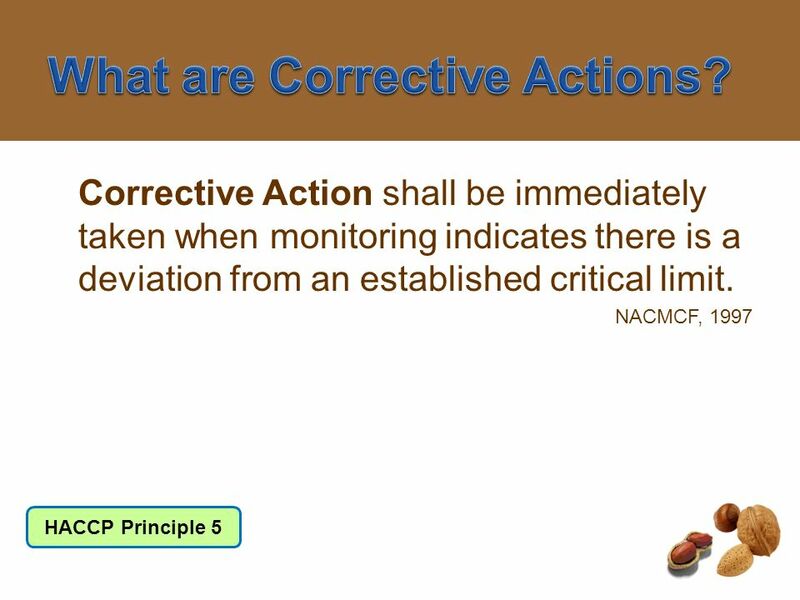 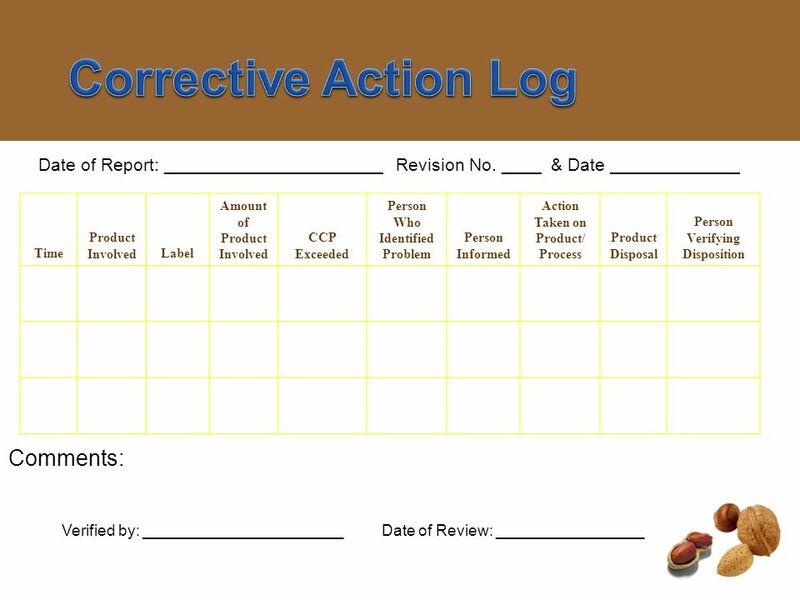 35 What are Corrective Actions? 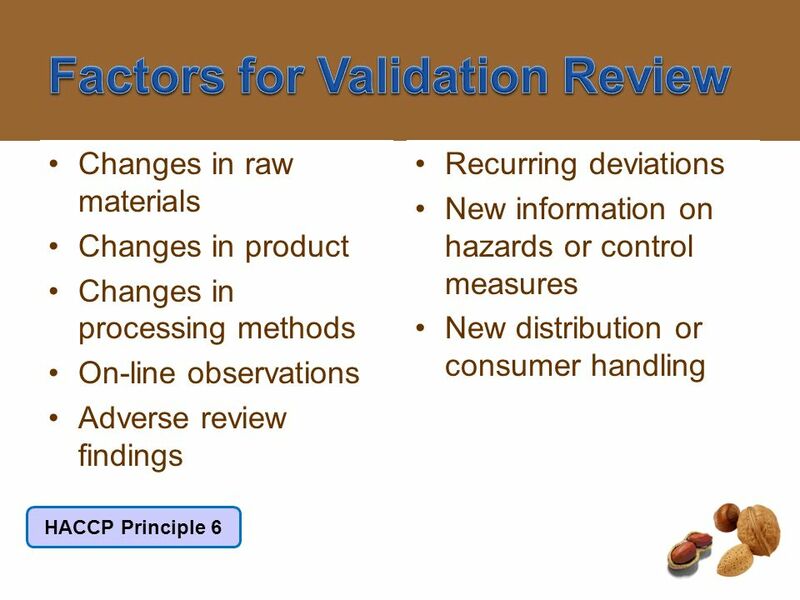 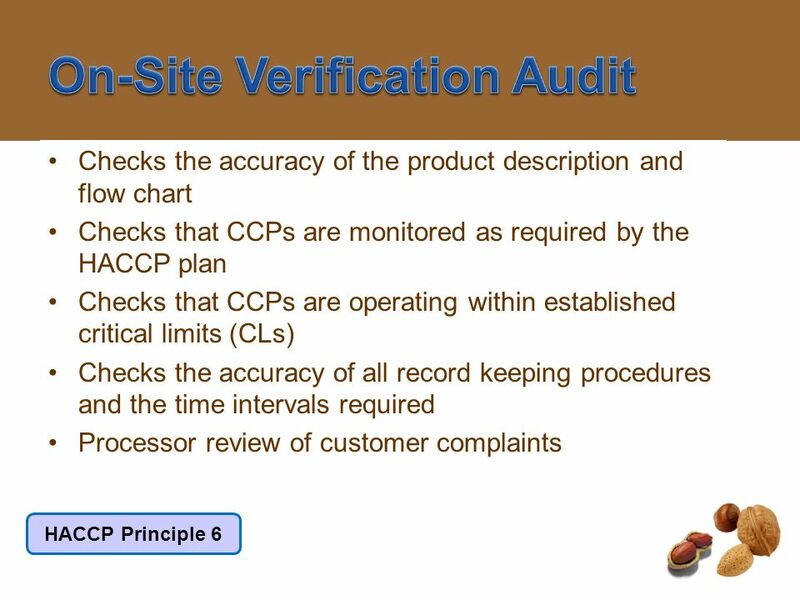 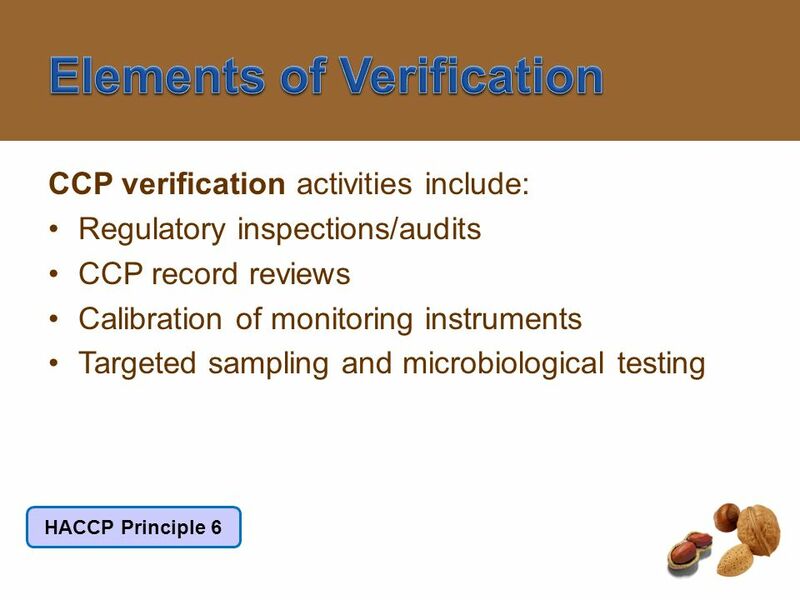 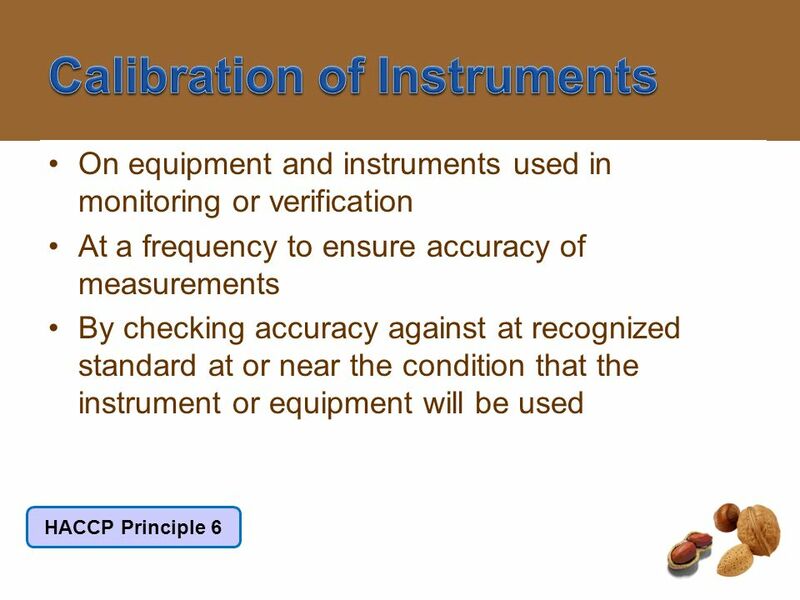 38 What are Verification/Validation Procedures? 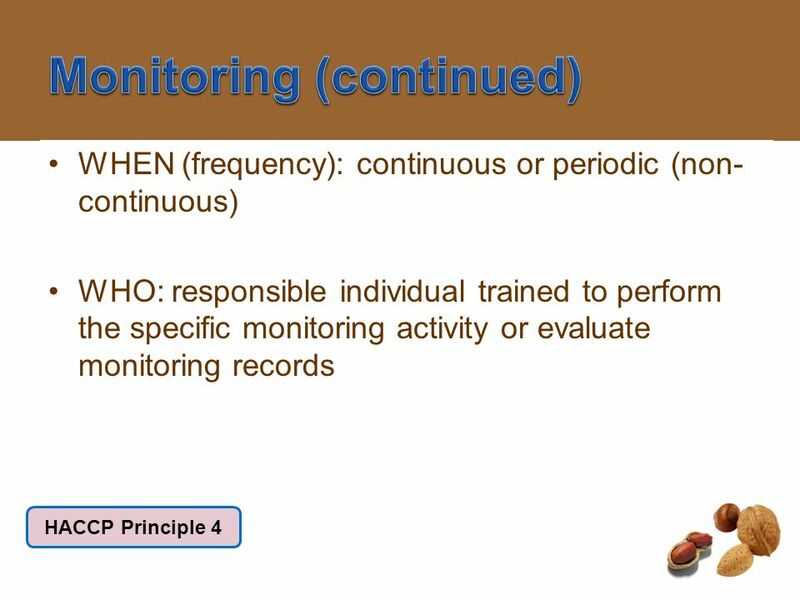 46 Who, When and How? 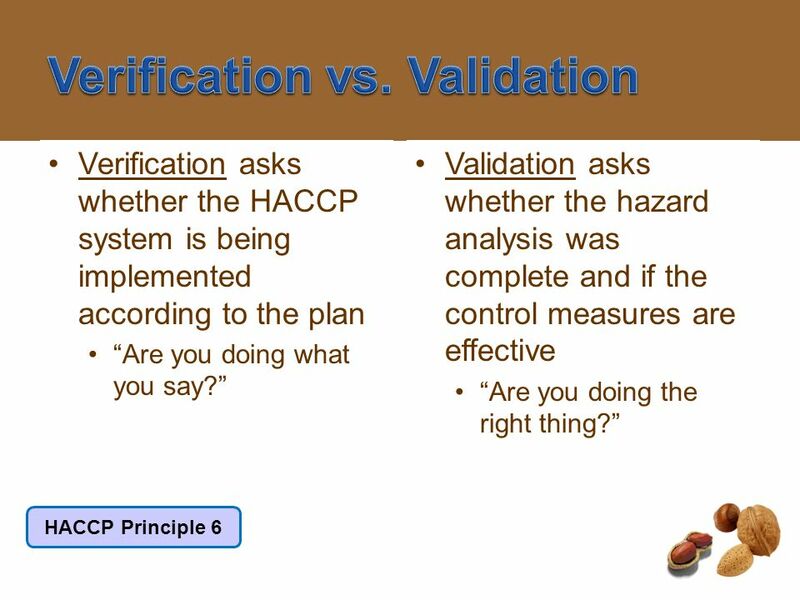 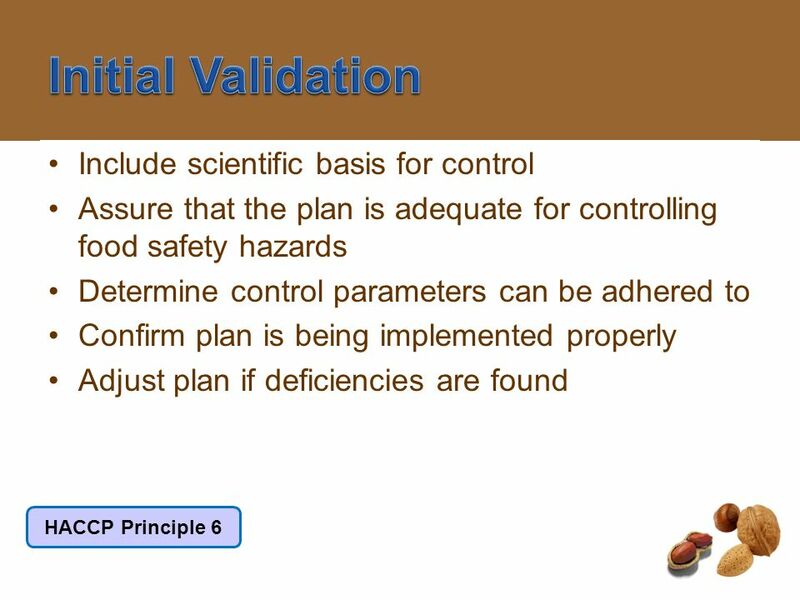 What does validation involve? 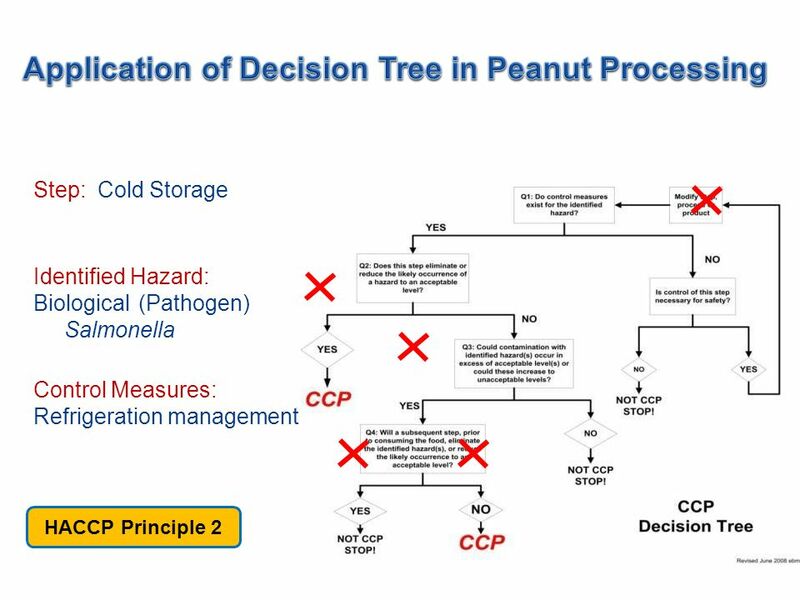 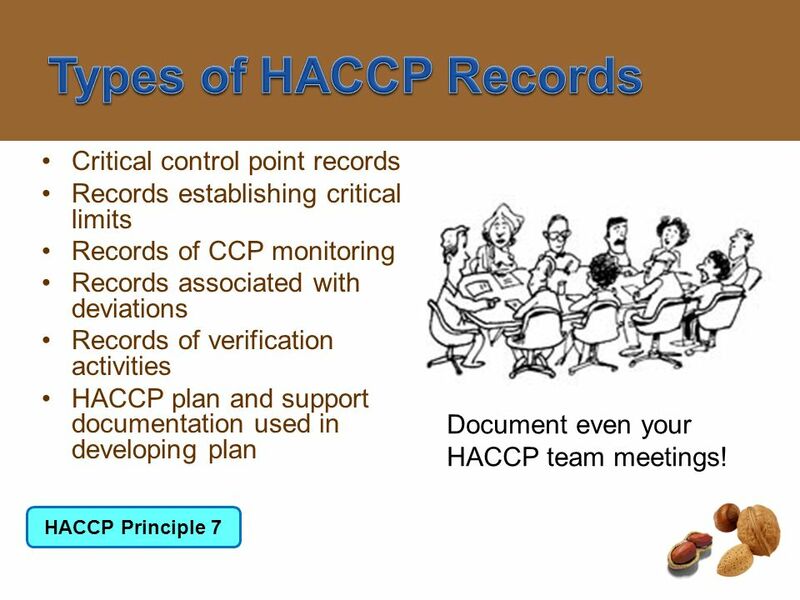 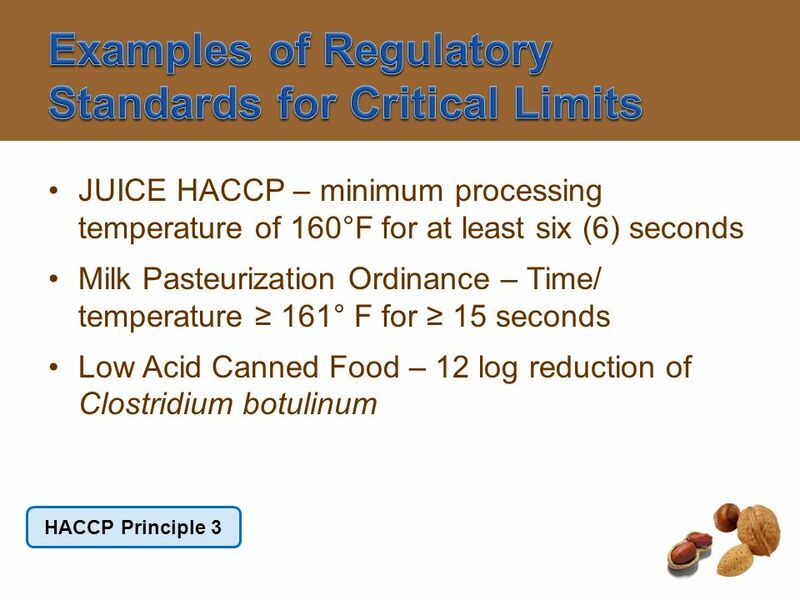 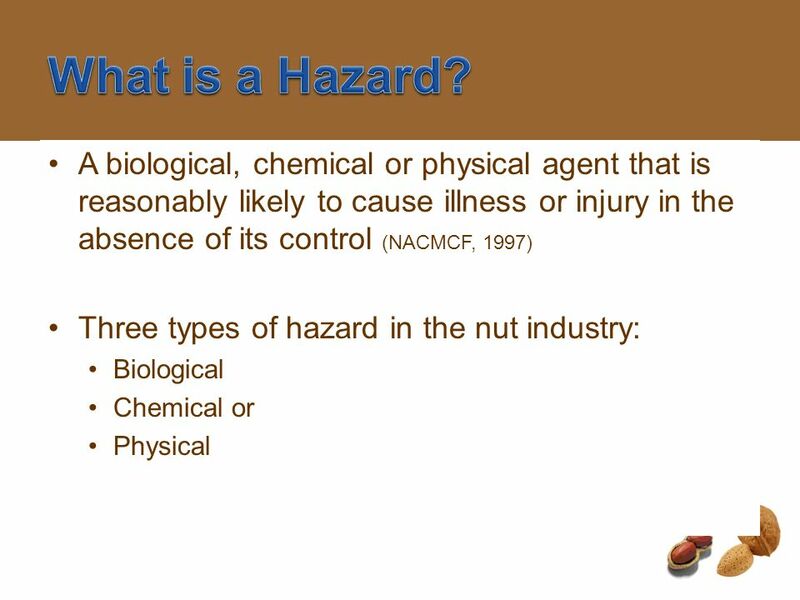 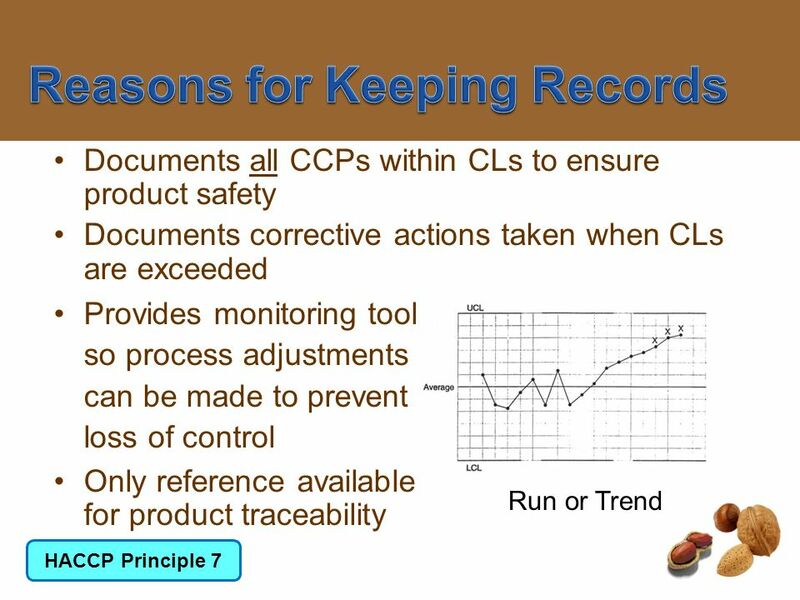 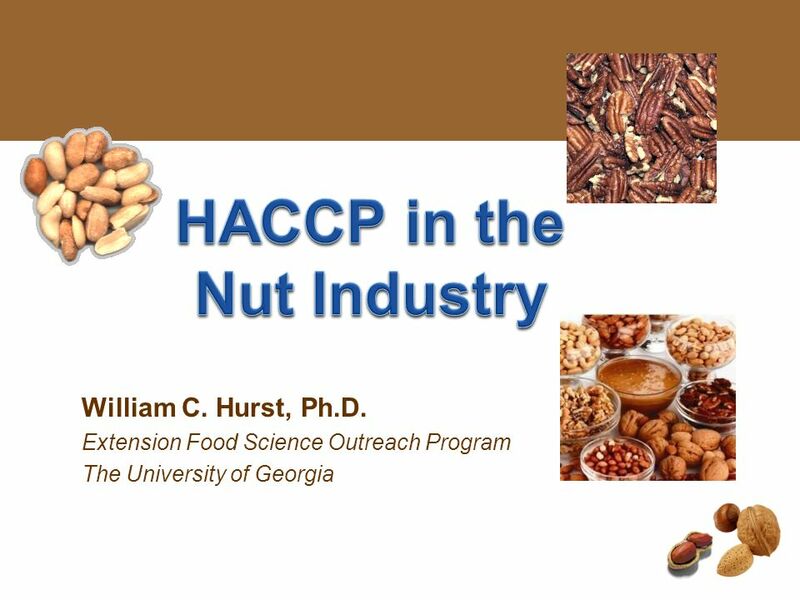 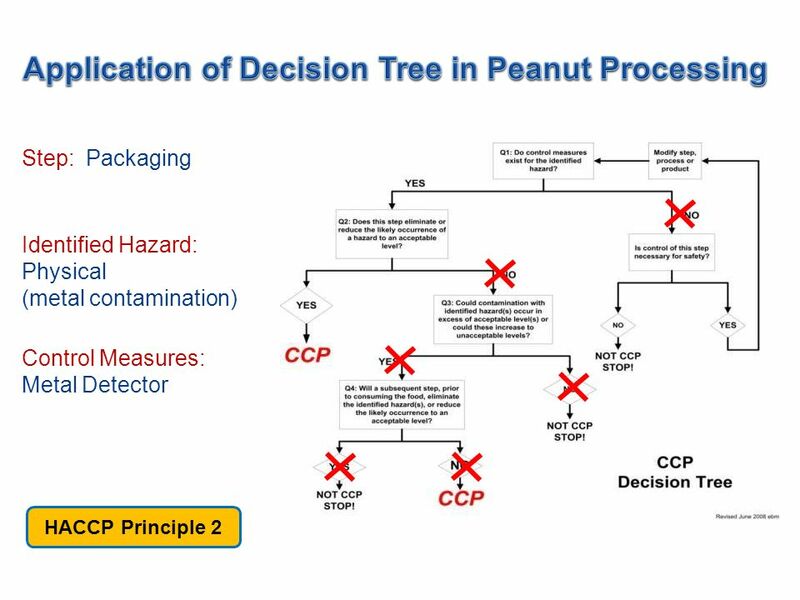 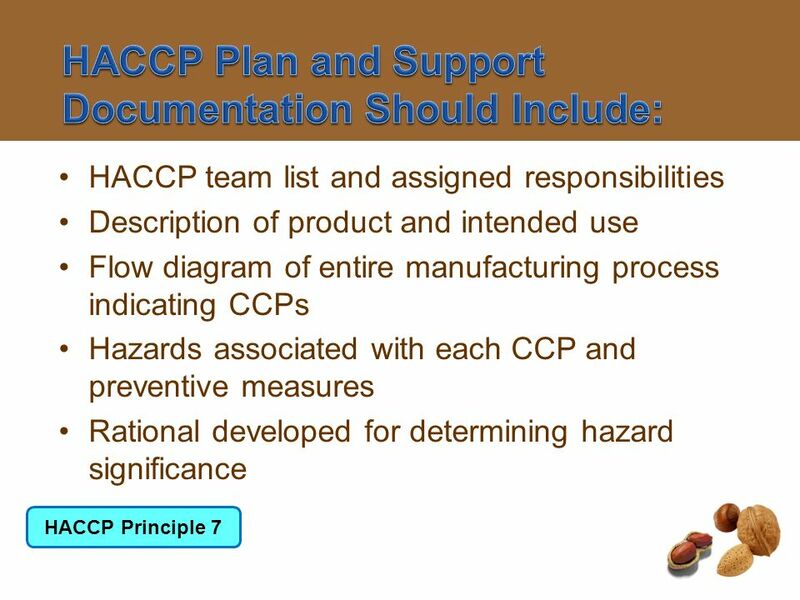 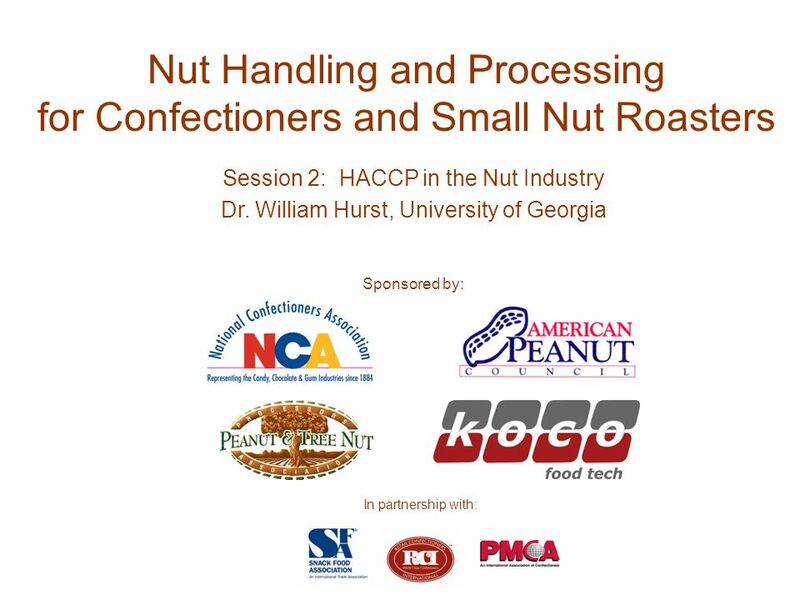 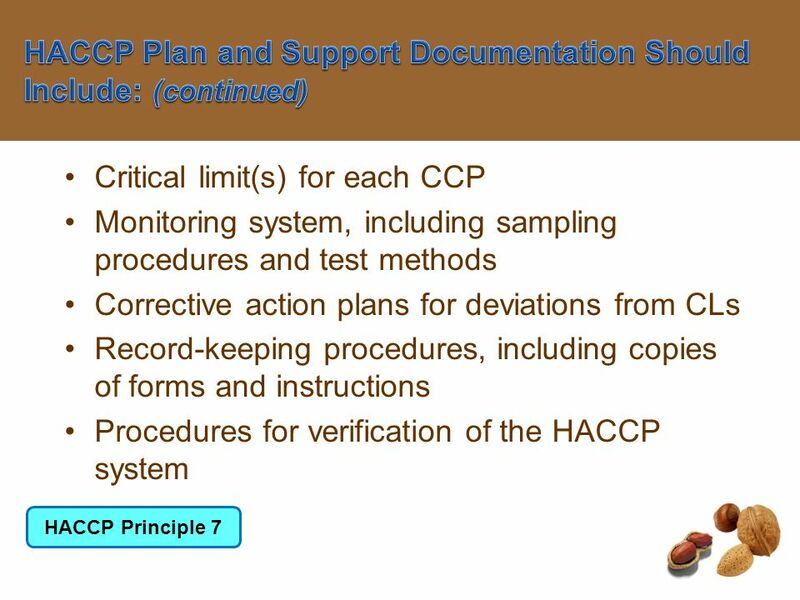 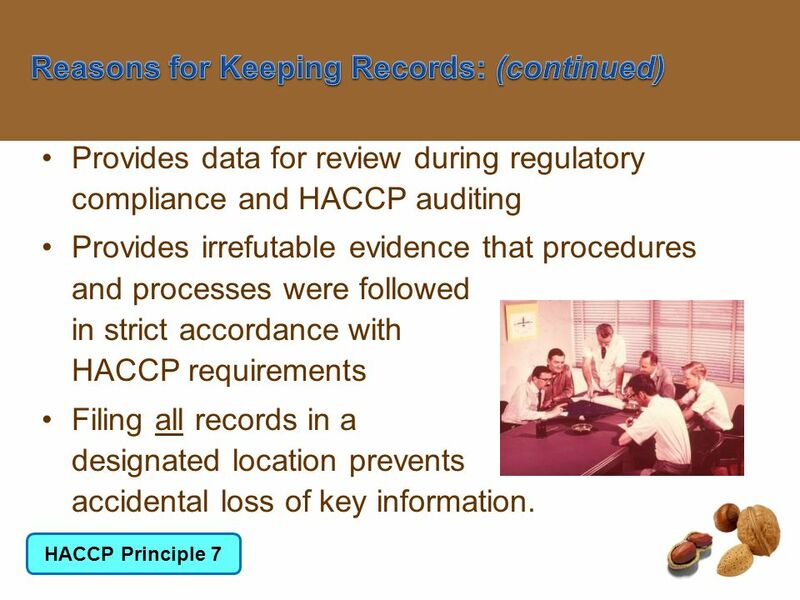 Download ppt "Nut Handling and Processing for Confectioners and Small Nut Roasters"
Seafood HACCP Alliance for Training and Education Chapter 11 Principle 7: Record-Keeping Procedures. 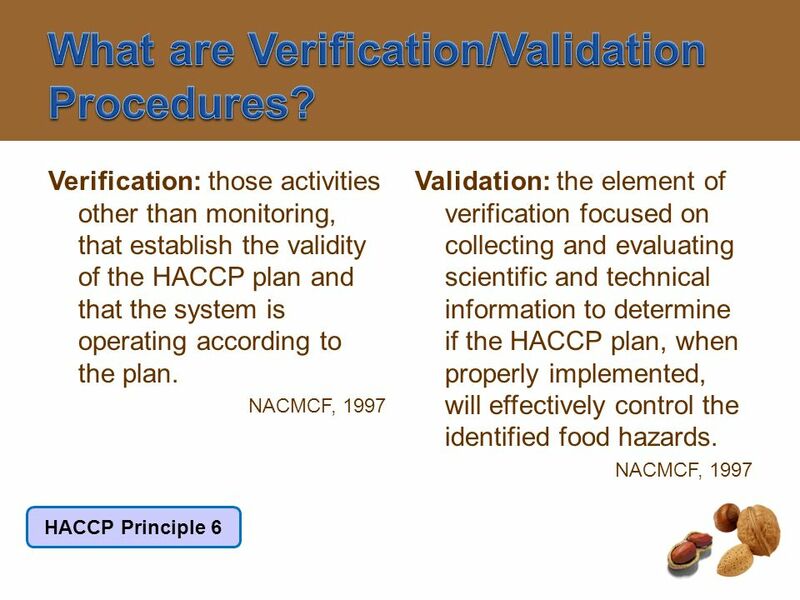 HACCP Validation The FSIS Perspective Charles Gioglio FSIS/OPPD Director, Meat and Poultry Advisory Committee Staff. 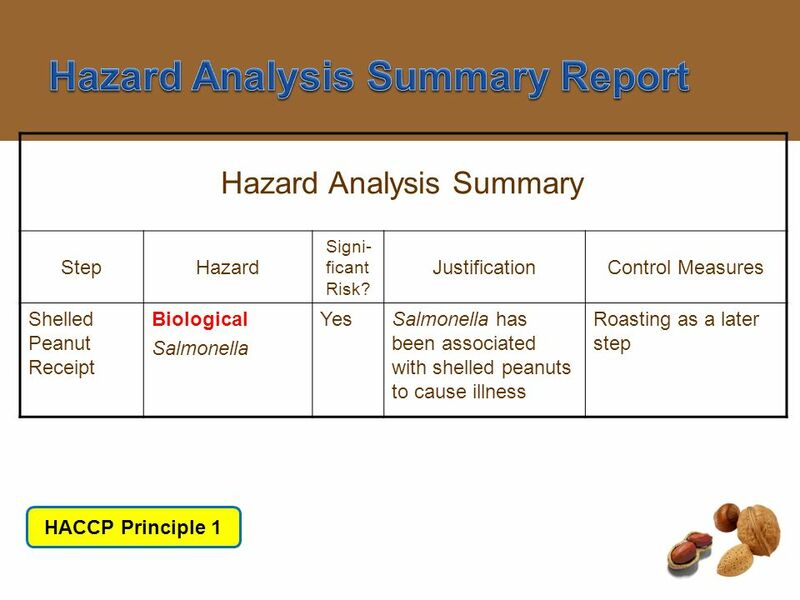 10-2 The five most common risk factors responsible for foodborne illness: Purchasing food from unsafe sources Failing to cook food adequately Holding. 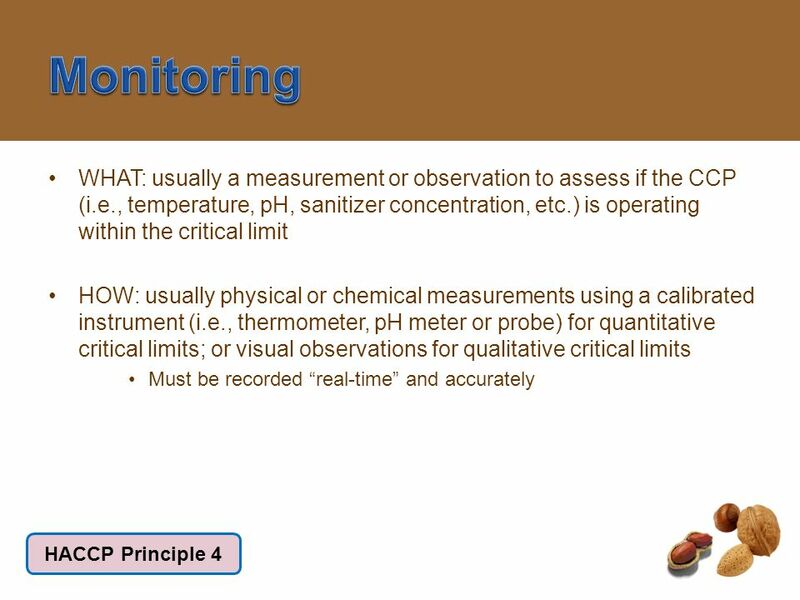 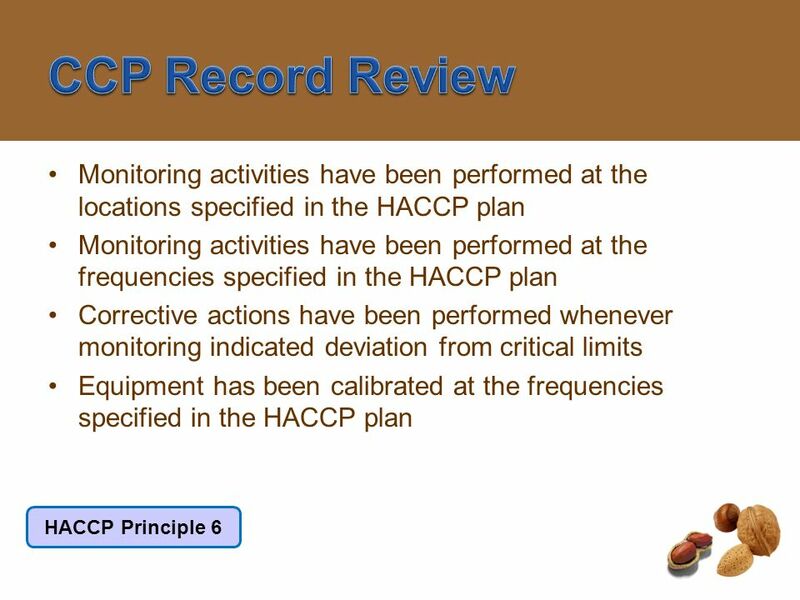 Chapter 8 Critical Control Point Monitoring. 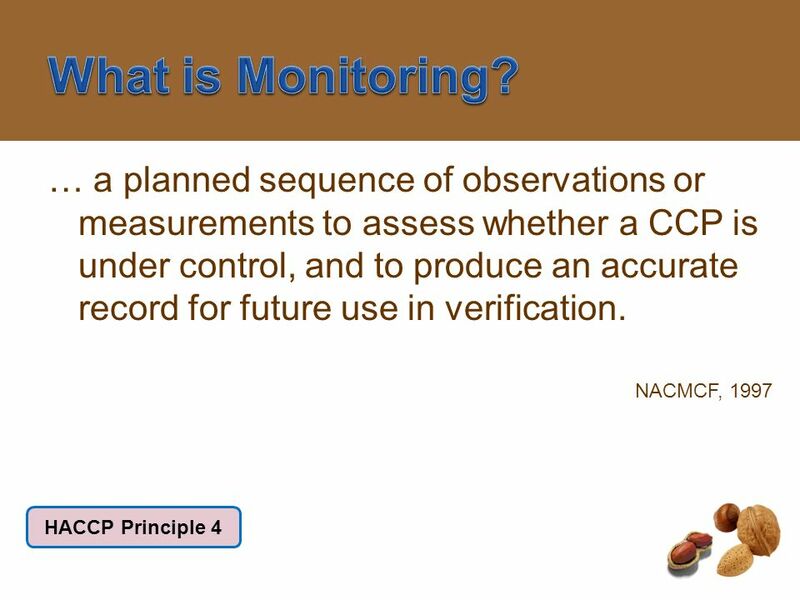 Objective In this module, you will learn: u How monitoring is defined u Why monitoring is needed u How to. 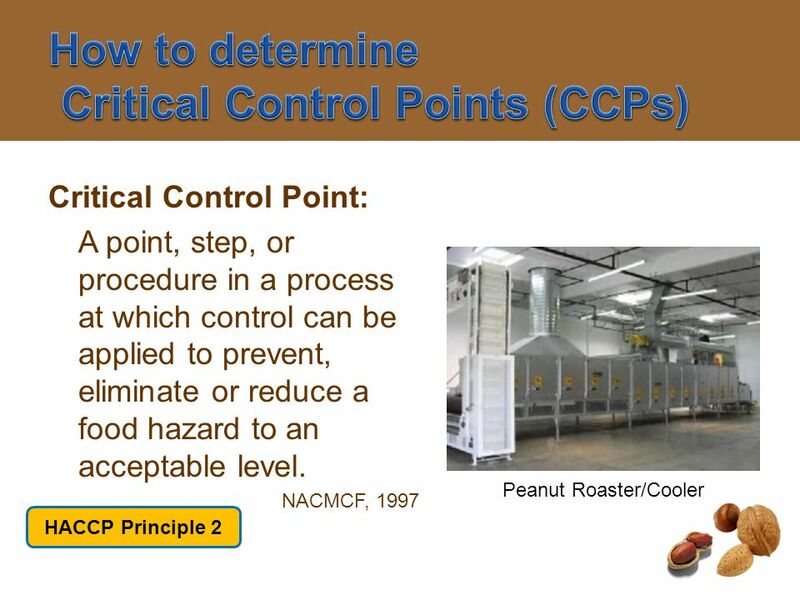 1 MANUFACTURING AND PRODUCTION OF BIOLOGICAL PRODUCTS (ERT 455) HAZARD ANALYSIS AND CRITICAL CONTROL POINT (HACCP) SYSTEM Munira Mohamed Nazari School. 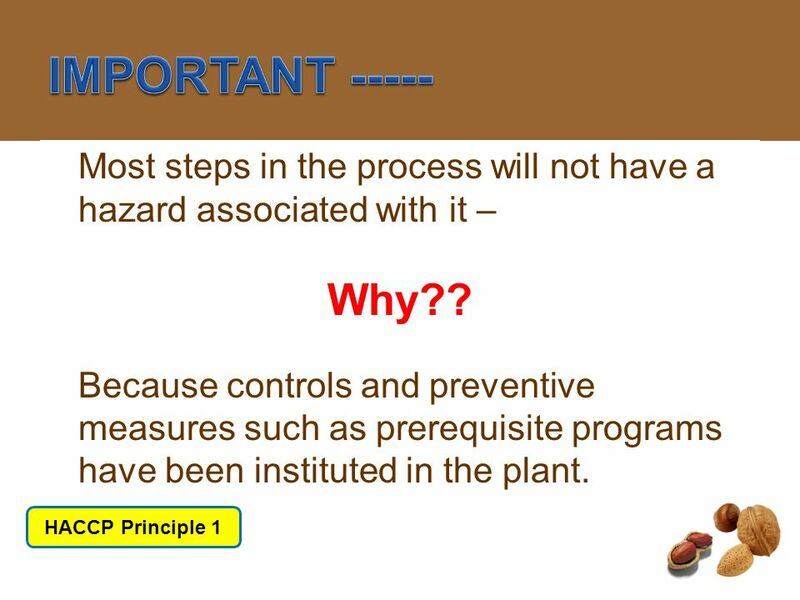 1 William H. Sveum, Ph.D. Kraft Foods – 09/2002 Role of Prerequisite Programs in Extraneous Material Management William H. Sveum Ph.D. 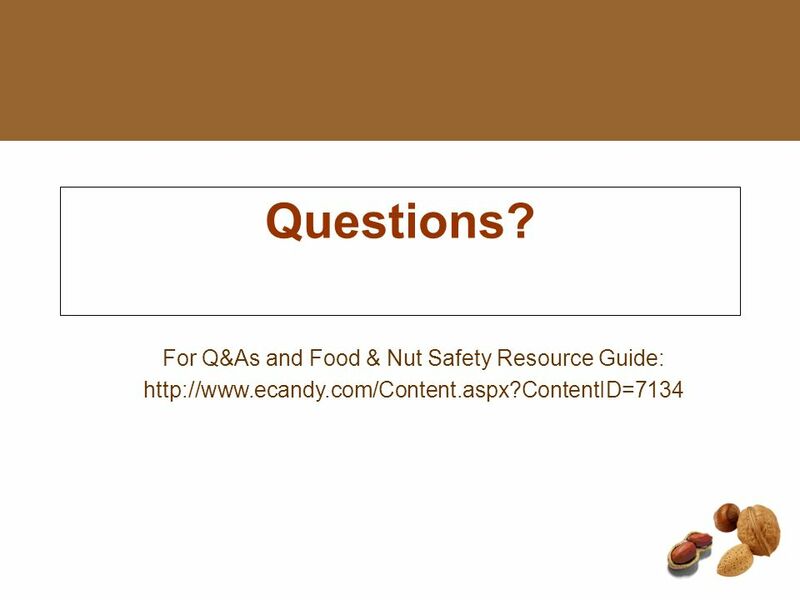 Associate Director. 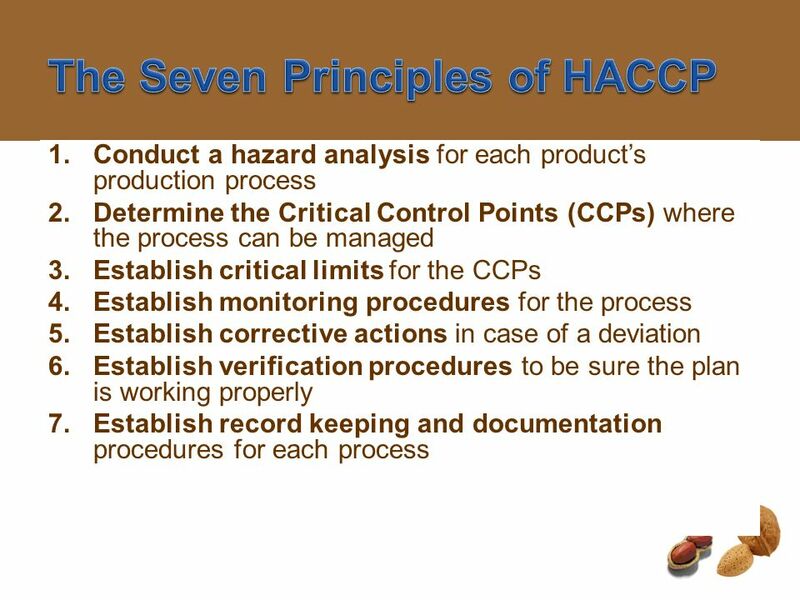 Quality Control Procedures & Raw Materials Raw materials are the tools, equipment, supplies, goods and services that a company requires to do business. 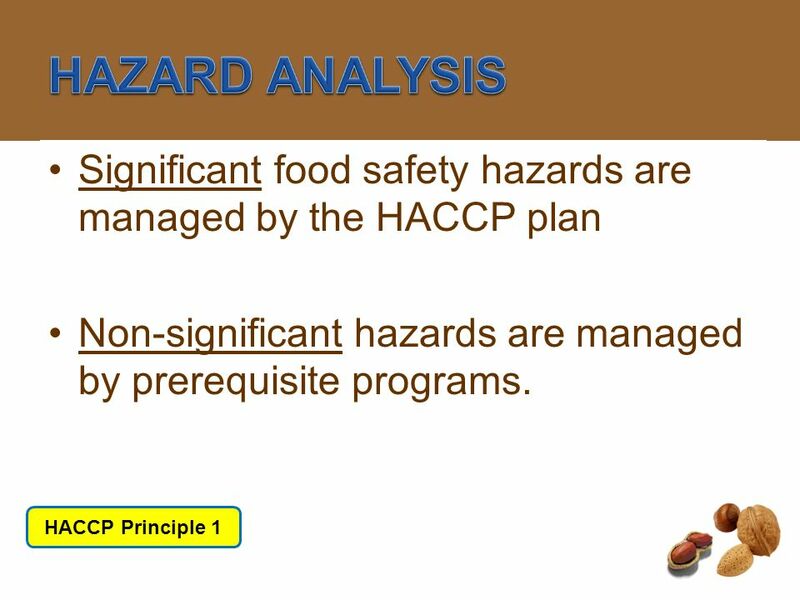 Introduction The main objective of the HACCP system is to provide a high degree (close to 100%) of assurance that a food ready to be consumed will be. 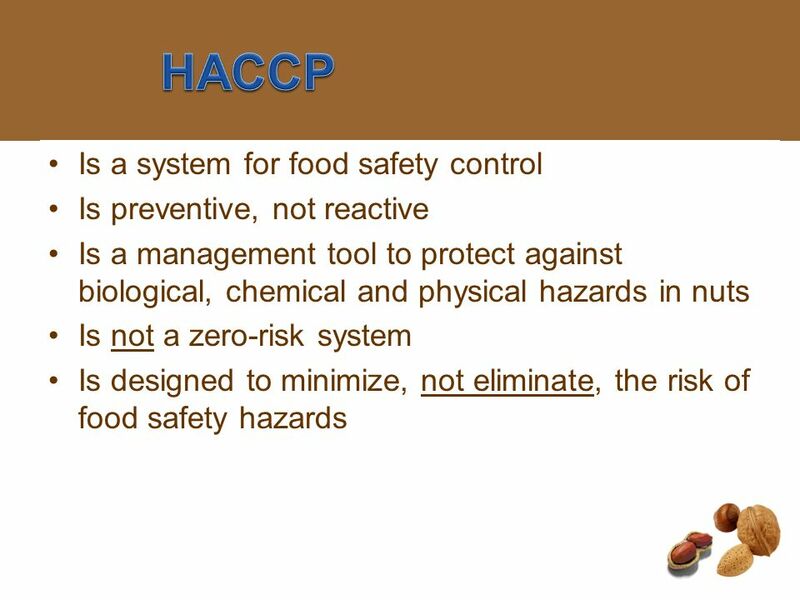 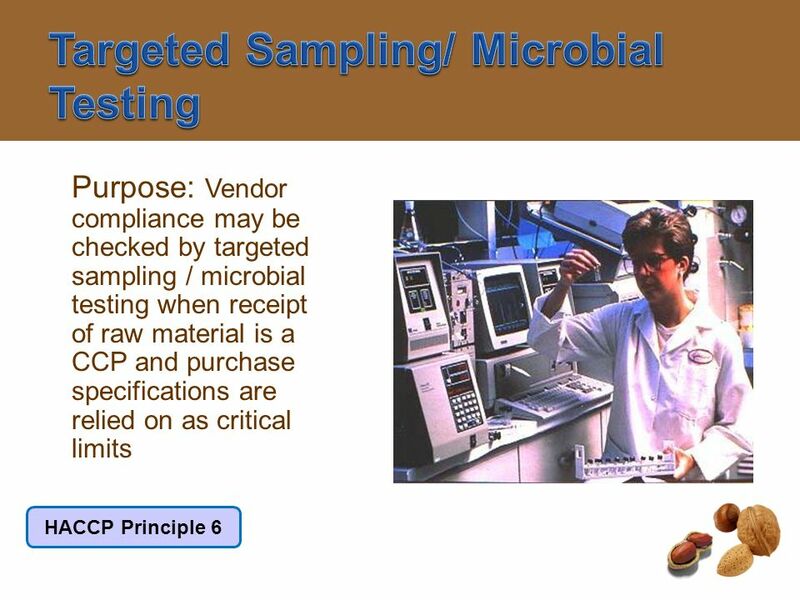 8-2 Food Safety Management Systems Food safety management system: Group of practices and procedures intended to prevent foodborne illness Actively controls.